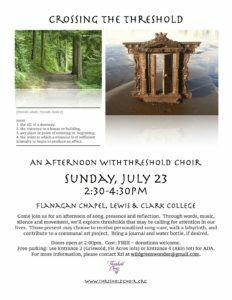 Come join us for an afternoon of song, presence and reflection. Through words, music, silence and movement, we’ll explore thresholds that may be calling for attention in our lives. Those present may choose to receive personalized song-care, walk a labyrinth, and contribute to a communal art project. Bring a journal and water bottle, if desired. Free parking: use Entrance 2 (Griswold, Fir Acres lots) or Entrance 4 (Akin lot) for ADA. For more information, please contact Kri at wildgreenwonder@gmail.com.